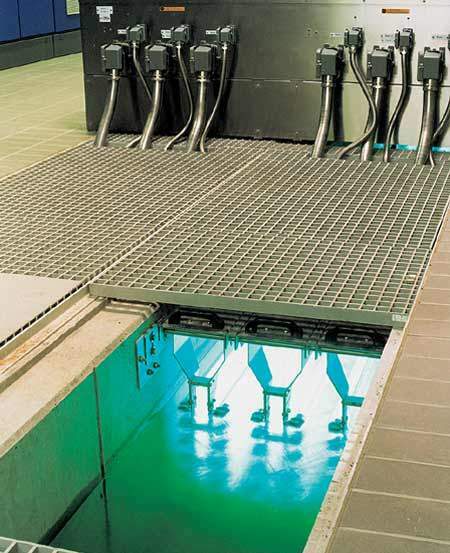 Ultraviolet lamps in water: stage 4 of the Rosedale upgrade involves the installation of UV at the plant. A series of site views. 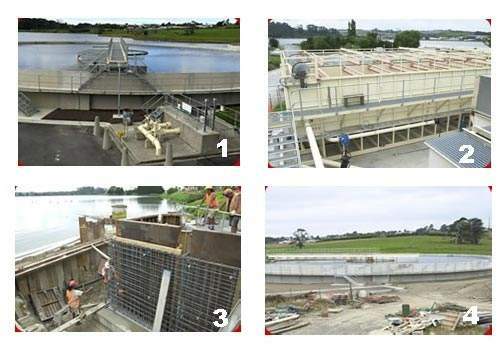 One of the clarifiers (1); DAF tanks (2); construction of the UV disinfection facility (3) and the fourth clarifier (4) in 2003. Rosedale WWTP provides primary, secondary and advanced treatment of effluent for a population of approximately 185,000. Wedeco TAK UV lamp element, the system which was selected for use at the plant. Manufacturer's photograph of a TAK installation. Tunnel and outfall schematic. The timing of the new sea outfall construction, which had originally been scheduled for stage 6 of the project (to be delivered by 2010), has been brought forward by two years. The designated route of the new outfall. More site views. Inlet screening building (5); sedimentation tank covers (6); sludge centrifuges (7); Lake Rosedale (8), once an oxidation pond and now used for final polishing. Rosedale WWTP, situated just north of Auckland, is the second largest treatment works in the Auckland region and is among the largest in New Zealand, providing primary, secondary and advanced treatment of effluent for a population of approximately 185,000 people. The Auckland region produces around 130m cubic metres of wastewater annually, of which 19.7m cubic metres are treated at this plant. Work to improve the biosolids processing, odour control and storage facilities has been completed as part of a programme of phased upgrades to the facility and its associated sewer network, which has been in progress since 1995. Further stages of the project involved further improvements in the sewer network, overhauling of the storm-water system and the construction of a new long sea outfall. Legislation has been central to the history of Rosedale WWTP. The facility was originally constructed under the authority given to the North Shore Drainage Board under the North Shore Drainage Act of 1951 to build, operate and maintain a treatment plant and outfall. Some 40 years later, the terms of the Resource Management Act, 1991 gave the city council ten years in which to apply for resource consents to continue the operation. "The Auckland region produces around 130m cubic metres of wastewater annually, of which 19.7m cubic metres are treated at this plant." Project Rosedale was set up to gain the necessary consents and in July 1998 a managing consultant was appointed to oversee the process, which included site status designation, agreeing the route of a new outfall and establishing an odour buffer zone around the treatment plant. In addition to the Resource Management Act, a number of other statutes had to be taken into account in the consent application process, including the New Zealand Coastal Policy Statement and a series of regional and district plans. The ultimate aim of Project Rosedale is to ensure the operation of the wastewater treatment plant until at least 2035, based on the programme of upgrades and improvements which will enable it to serve a population of up to 300,000. 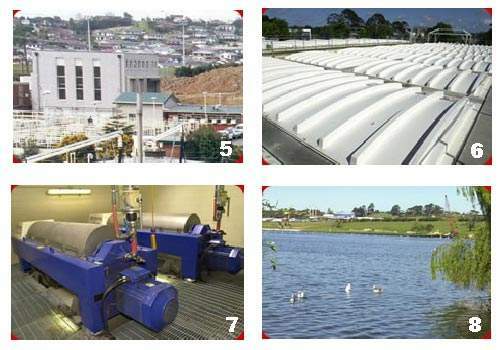 In April 2001 the Auckland Regional Council (ARC) approved resource consent applications for upgrading and the ongoing operation of the Rosedale plant, placing stringent conditions on operation and odour control. The initial period of consent for the main treatment plant was ten years, which the city council are actively seeking to extend, to gain a greater measure of security regarding the future, given the large sums being allocated to the improvement programme. 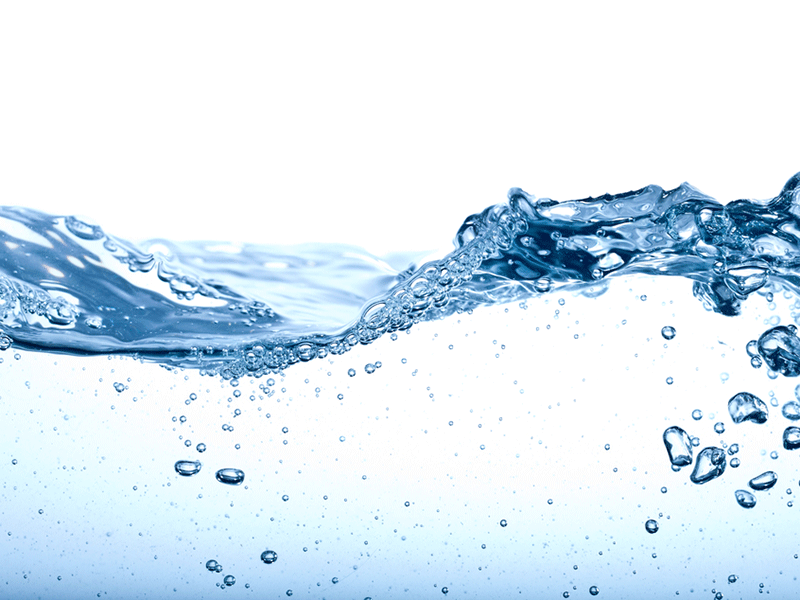 Wastewater treatment in the Auckland area is undergoing a period of significant change. Part of the reason for this is population growth – the Auckland region contained just more than 1.2m inhabitants in 2003; this is estimated to rise to more than 1.6m by 2020 – which will place obvious extra demand on services. In 1962, when the Rosedale plant was built, it was required to deal with the wastewater from a population of 70,000. By 2003, this had risen to nearly 203,000 and is expected to approach 253,000 by 2020. Increasing environmental awareness and progressively stringent regulatory controls have also played a part in the industry’s change. Such drivers include the adoption in 2004 of a new faecal Coliform standard and New Zealand Government’s Waste Minimisation Strategy, which calls for 95% of biosolids to be reused or composted. To meet the combined demands of an ageing plant, a growing population and altered regulatory framework, North Shore City Council embarked upon an extensive programme of upgrades to both the Rosedale WWTP itself and the associated sewerage infrastructure. Implementation was designed in a series of phases. "Increasing environmental awareness and progressively stringent regulatory controls have also played a part in the industry’s change." Stage one involved the construction of an activated sludge reactor, a secondary clarifier and a dissolved air flotation tank. This phase of the project was implemented to reduce the loadings entering the oxidation ponds, therefore reducing odour nuisance from the plant. A blower switch-room building and other associated works were also provided as part of this phase, which was completed in 1995 at a cost of more than NZ$11m. Completed in 1999, stage two provided additional sludge treatment capacity, principally involving the construction of a mechanical dewatering facility and the provision of two further digesters, each with a 50% larger capacity than the pre-existing ones. Also included in this stage was a new rotating inlet milliscreen to exclude inorganic oversized material from the inflow. Stage three extended the secondary and tertiary treatment capacity of the plant, adding two new sludge reactors, two new clarifiers and a dissolved air filtration unit together with additional generators, new air blowers, increased solids-handling capacity and biofilters. When the second and third reactors were commissioned the process was converted to allow biological nitrogen reduction using the Modified Ludzack-Ettinger (MLE) process, which involves incorporating anoxic regions in the line and recycling mixed liquor. In addition, the original sludge digesters were upgraded and a third centrifuge was added to the sludge dewatering facility. This phase was completed in 2001 and produced a significant improvement in final effluent quality. 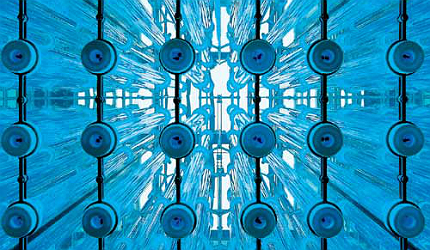 Completed in 2004, stage four of the Rosedale upgrade involved the installation of Wedeco’s TAK UV system to provide ultraviolet disinfection at the plant. 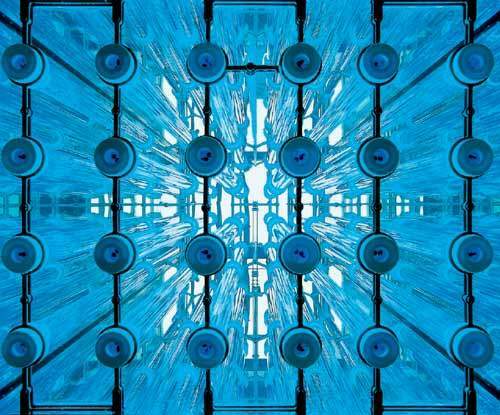 The installation has been designed to allow for ultimate expansion to a six-channel system, containing nearly 1,300 individual lamps, to enable the full peak flow of 3m³/s to 4m³/s to be treated and consented effluent quality standards met. Stage four had a total estimated cost of NZ$31m, of which the UV system accounted for $NZ2.26 m, and also included the provision of peak flow treatment capacity together with major upgrades to both the plant’s biosolids and odour control facilities. Stage five of the upgrade programme was completed in May 2008 at an investment of $17m. The project involved installation of new larger grit traps, new odour biofilters, additional inlet screening capacity and construction of two extra primary sedimentation tanks. With this upgrade, the plant’s capacity has increased by 40%. The $119m Rosedale Tunnel and Outfall project was officially opened in August 2010. The project was started in February 2009. 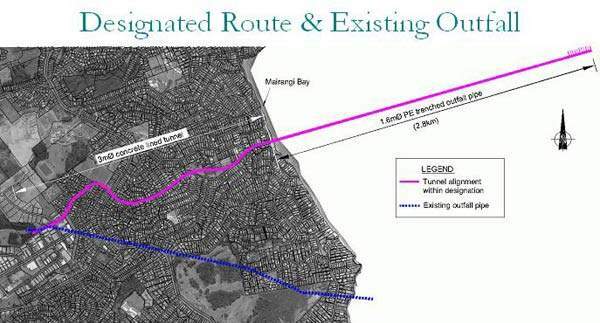 The 2.6km underground tunnel transfers the plant’s treated effluent to Mairangi Bay, from where treated effluent is dispersed into the Rangitoto Channel through a 2.1km outfall pipeline. The project won the 2011 Ingenium Excellence Award for projects more than $10m and the Gold Award at the ACENZ INNOVATE NZ Awards of Excellence 2011. The upgrade programme was not without its challenges. Since changing to the MLE process, the lakes have no longer been used as traditional oxygenation ponds, but rather as polishing waters. With the load on the ponds dramatically reduced, algae blooms have largely ceased and relatively high dissolved oxygen levels have been established. However, the cleaner water has led to the appearance of midge larvae. These were monitored very closely to ensure that numbers do not reach levels which may pose a potential nuisance to nearby residents. "North Shore City Council embarked upon an extensive programme of upgrades." Improved efficiency also brought a second problem. Modern treatment processes remove more biosolids – and thus produce more sludge – than older plants, placing additional burdens on disposal arrangements, which have historically centred on landfill, currently the cheapest option available. Recognising that this is not sustainable in the long-term, the council explored alternatives, including composting, beneficial reuse as a soil conditioner or applications in forestry. To comply with the Governmental Waste Minimisation Strategy, 95% of biosolids was to be reused or composted. Finally, the timing of the new sea outfall construction, which had originally been scheduled for stage 6 of the project – to be delivered by 2010 – was brought forward, with the ARC requiring it to be finished by 1 July 2008. Needing to fund the $60m estimated cost two-and-a-half years earlier than expected, the council faced hard decisions as to whether it should delay making improvements to the sewer network, postpone upgrades to the storm-water system or increase rates to raise the money. The treatment plant and outfall are owned, operated and maintained by North Shore City Council. Sinclair Knight Merz were the consulting engineers on the stage 4 upgrade and Simpson Grierson were the environmental planning consultants. 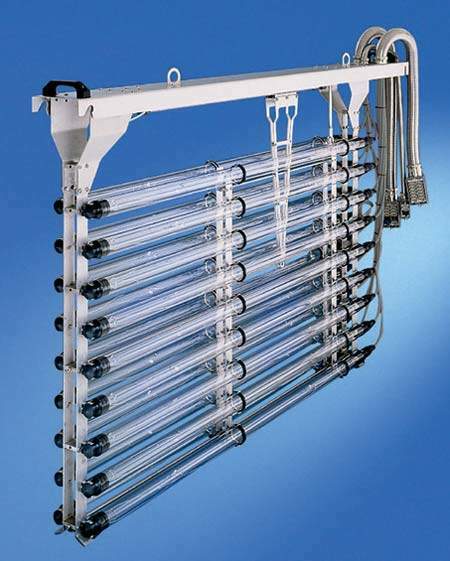 The original design of the nutrient removal system was done by URS and the UV system was supplied by Wedeco. Tunneltech and United Networks and a number of local construction firms were also involved in various aspects of the project work. The maintenance contractor was Techscape. Stage 5 contract was carried out by Fulton Hogan. CH2M Beca, and Evans and Peck were North Shore City Council’s consultants. The Rosedale Tunnel and Outfall project was completed by McConnell Dowell, AECOM, Aurecon, Tonkin & Taylor, LOVAT and Wilson Precast Tunnelling. 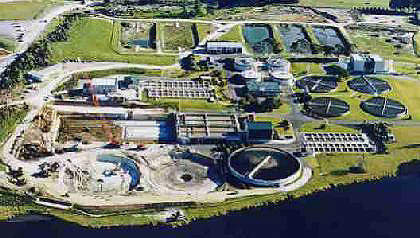 The expansion of Rodney District’s Army Bay Sewage Treatment Plant, North Island, New Zealand, was completed in 2007. Christies Beach Wastewater Treatment Plant (CBWWTP), located in the southern Adelaide metropolitan area, has been part of an upgradation project since early 2009.